You should be automatically redirected. If not, visit http://www.somethingilearned.com/ and update your bookmarks. With everything going as of late it took until today for me to discover that guitar legend Link Wray died November 5, 2005. Wray first began performing in the early 1950's and continued to record and perform for over 50 years. 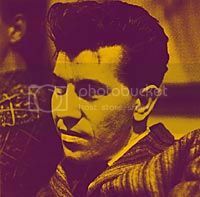 Virtually ever article I've read about Link Wray will credit him with being the father of the power chord in addition to attesting to his influence over several generations of guitarist. Who am I to dispute this? I remember when I first heard "Rumble" - I was amazed that a track so raw and edgy could have been recorded in 1958. My personal favorite though is "Big City After Dark" - a skronky blues number with an absolutely filthy guitar sound. Wray's best works were recorded during the years 1958 - 1965 and have been collected many times over. For a quick overview Rumble, The Best of Link Wray is a tight, 20 song collection. Also recommended, the Mr Guitar double disc on Norton.